Venezuelan opposition leader Juan Guaido, who many nations have recognised as the country's rightful interim ruler, gestures as he speaks during a protest against Venezuelan President Nicolas Maduro's government in Caracas, Venezuela, March 12, 2019. 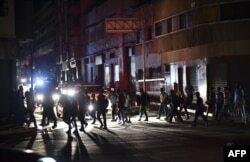 Venezuelan officials reported blackouts easing in some areas Tuesday, while the chief prosecutor said opposition leader Juan Guaido is being investigated for allegedly sabotaging the national power grid, whose collapse last week has inflicted misery on millions. The announcement by Tarek William Saab, the attorney general, escalated the Venezuelan government's standoff with Guaido, although there are questions about how aggressively authorities would move against a man who is staunchly supported by the United States as well as many Venezuelans. Guaido, who is trying to oust President Nicolas Maduro and hold elections, blames corruption and incompetence for nearly a week of nationwide blackouts that deprived most of the already struggling population not just of electricity, but also water and communications. Adding to tension over Venezuela's fate, the United States said it was withdrawing its last diplomats still in Caracas. The U.S. State Department also said U.S. citizens residing or traveling in Venezuela should leave the country, a heightening of an advisory issued Jan. 29 that said they should ``strongly consider'' doing so. "Bye-bye," Maduro said on national television after praising the professional conduct of James Story, the top-ranking diplomat at the U.S. Embassy. Maduro also said he would seek the help of allies Cuba, Russia, China and Iran in investigating his allegation a U.S. "cyberattack" targeted Venezuelan power facilities, which he claimed was launched from Houston and Chicago. 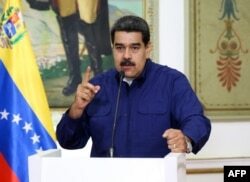 FILE - Handout picture released by the Venezuelan presidency showing Venezuelan President Nicolas Maduro speaking during a press conference at the Miraflores Presidential Palace in Caracas, Venezuela, March 11, 2019. The U.S. has dismissed the Venezuelan government's accusation as absurd and an attempt to divert attention from its own chronic failings. Venezuela's information minister, Jorge Rodriguez, said the power grid had been almost completely restored and that water service was also returning. However, anecdotal reports indicated continuing outages for many Venezuelans, who were already suffering from hyperinflation and shortages of food and medicine. On Tuesday, long lines of people converged again at springs in the mountains of Caracas to collect water in bottles because water pumps have been out of service without power. People collect water from a truck that delivers water during rolling blackouts, in Caracas, Venezuela, March 12, 2019. Even some relatives of Maduro couldn't stand the power outages, according to authorities in Colombia. The leader's cousin, Argimiro Maduro, along with his spouse, children and extended relatives, tried to enter the neighboring country, seeking relief until power is restored in Venezuela, said Christian Kruger, Colombia's migration director. Permission was denied. Colombia, which views Maduro as an illegitimate leader and recognizes Guaido as Venezuela's interim president, will not allow Maduro's relatives to vacation while "avoiding the reality of a people in agony," Kruger said. Maduro did not comment on the report that his family members tried to enter Colombia, though he has said he has been suffering alongside Venezuelans during the blackout. One of the areas hit hardest by the power cuts that started Thursday evening is the city of Maracaibo, where widespread looting has occurred since Sunday. On Tuesday, areas of the city still had no power and debris lay in some streets. Hundreds of people looted nearly half the 270 shops in Maracaibo's Sambil mall, even dismantling doors and windows and taking them away, said Juan Carlos Koch, the mall's general manager. People cross a street during a power outage in Caracas, March 7, 2019. Saab, the chief prosecutor, said the case against Guaido also involves messages allegedly inciting people to rob and loot during power outages. Guaido is already under investigation for alleged instigation of violence, but authorities have not tried to detain him since he violated a ban on leaving the country and then returned a week ago from a Latin American tour. He said at a Caracas demonstration Tuesday that allegations that he sabotaged the power grid are false. "The whole world knows who the saboteur is. Maduro is responsible," said Guaido, who has accused the government of negligence and looting state resources for years. Authorities also detained a Venezuelan journalist and activist and confiscated computers and cellphones from his home, human rights activists said. The arrest of Luis Carlos Diaz after he left Union Radio station Monday followed an accusation by a pro-government leader that he caused Venezuela's blackouts, Human Rights Watch said. Michelle Bachelet, the U.N high commissioner for human rights, said that she is concerned about Diaz and that a U.N. mission visiting Caracas asked authorities for access to him. News of the withdrawal of the last U.S. diplomats came from Secretary of State Mike Pompeo, who tweeted late Monday that the continued presence of the envoys in Caracas had become a "constraint" on U.S. policy. He did not clarify exactly what he meant by that remark. U.S. President Donald Trump has said "all options are on the table" in his administration's support for Guaido. Maduro accuses Guaido and the United States of plotting an invasion. The Venezuelan government disputed Pompeo's account, saying it had instructed the U.S. diplomats to leave. Their presence "entails risks for the peace, integrity and stability of the country," Foreign Minister Jorge Arreaza said. Maduro's government in January cut ties with the U.S. over its recognition of Guaido as Venezuela's rightful leader, a stand taken by about 50 other countries. U.S. officials rejected that, saying Maduro had no authority. Venezuela later allowed a skeletal staff to remain at the hilltop U.S. Embassy.